There's a new Sketch Challenge up on the Paper Bakery blog, of course I had to change things up a bit to make it my own ;) Here's my take on Sketch # 16, using the October scrapbooking kit. As you can see, I turned the 8 small rectangles behind the photos into 4 long rectangles as the focal point for my layout, and cut 1 of them into a banner shape to pull that idea from the sketch. I used only 1 photo instead of 2, but you could even use 4 small photos just as easily! I also placed my title directly under the photo like in the sketch, using one of the chipboard pieces from the kit. To add more color and dimension, I did a little fussy cutting of the pretty floral paper, and added it along with more of the chipboard pieces. Add in a few lines of journaling, and my layout was complete! This Sketch Challenge is open for 2 weeks, why not give it a try? Just link up your project on the sidebar of the Paper Bakery blog. Winner will be chosen at random and you could win a prize from the Paper Bakery!! what a great "old" photo :) Love what you do with the sketch to make it your own. This is gorgeous!! LOVING the colors and loving the bits you added to it!!!! Awesome! love your interpretation of the sketch, love the colors that bring out this precious black and white picture. Wonderful! Love your take on the sketch, Mary Ann! Great layout! So pretty! 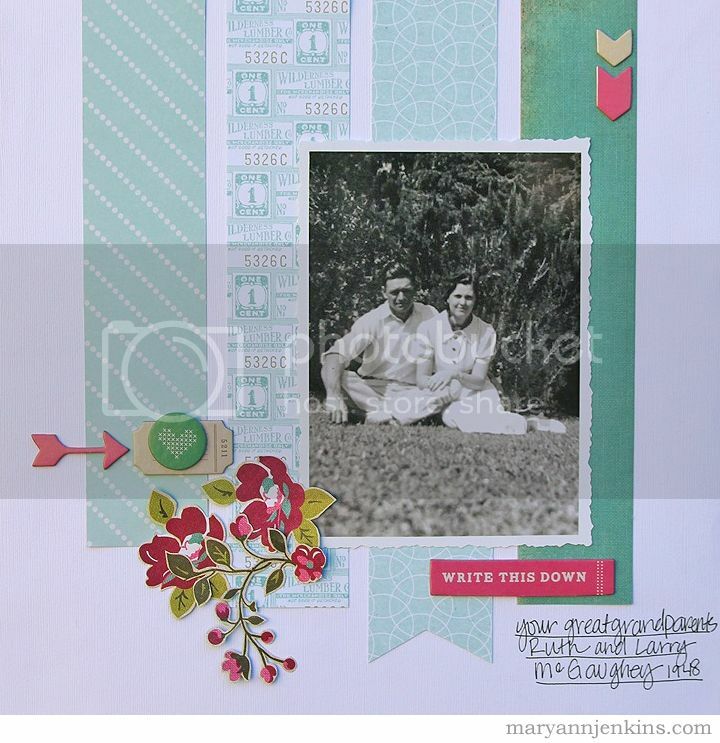 Love the fussy cutting! So pretty Mary Ann!! 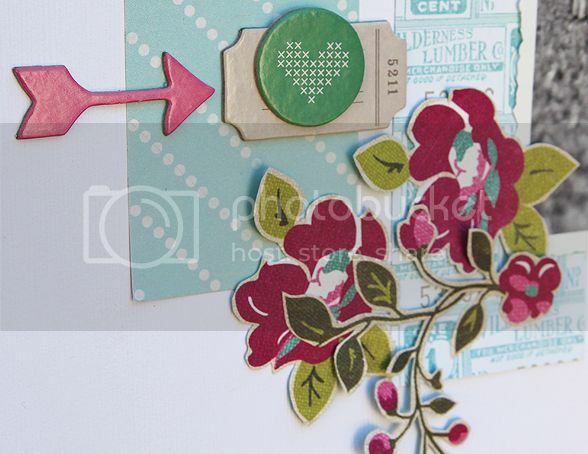 LOVE that fussy cut flower against the soft Blue colors in the background! And Congrats on having your layout Spotlighted at Elle's today! I love the colors and clean lines of this layout. Very pretty layout - love the colors!